Is The Law Of Attraction Biblical? Most people have heard the phrase, “Opposites attract.” It is often used when describing two totally different people being attracted to each other. This phrase uses the idea of opposite ends of magnets being attracted to each other through magnetism. However, there is a spiritual idea in some circles called the Law of Attraction. To fully understand if this “law” is Biblical, it must be examined in its popular sense. Then it must be compared with God’s Word so that we can know what is the Law of Attraction as it relates to Scripture. What is the common understanding of the law of attraction? While this statement seems somewhat simple and reasonable, it is the “spiritual” power behind this statement that requires investigation. Looking further, it is easy to find that the Law of Attraction, also known as “New Thought,” is rooted in the belief that people and their thoughts are made up of pure energy that attracts other similar energies. Here, Satan temped Eve with having supernatural knowledge. Of course, we find out soon after that this “knowledge” was really a curse that had a deadly effect on humanity (Romans 5:12-28). So the question then becomes, do humans have the ability to create supernatural change out of their direct physical control by just the power of their mind? What power do humans have in their mind? These are only a fraction of verses that teach us that only God is the I Am (Exodus 3:4); Alpha and Omega (Revelation 1:8); the Word (John 1:1,14); Healer (Exodus 15:26); Provider (Genesis 22:14); Forgiver (Psalms 99:8); Master (Genesis 15:2); Everlasting (Genesis 21:33); Shepherd (Psalms 23:1); Maker (Psalms 95:6); and Creator (Isaiah 40:28). How is the law of attraction promoted? Most of these promoted “New Thought,” Law of Attraction practices are not new at all. However, the teachings continue to be repackaged so it may be taught in schools, medical practices, and fully endorsed by psychology practitioners in such a way that more and more people accept them into their lives. This is despite many studies showing that at best, these practices have a placebo effect that convinces people that they have powers to do things that are helping them “reach their full potential.” According to Scripture, these practices are nothing more than the worship of devils (1 Corinthians 10:20-21; 1 Timothy 4:1). Therefore, we should avoid these practices (Romans 16:17-18; 2 Corinthians 6:11-18). Sadly, if people would spend a fraction of the time learning how to be empowered from on high by the Holy Spirit, they would learn that there is a source of power, which enables us to do all things (Philippians 4:13). That power comes from the power of God through the Gospel of salvation (Romans 1:16) that keeps us secure in the hand of God (John 10:28-29; 1 Peter 1:5) and gives us peace and power beyond all understanding (Philippians 4:6-9; 2 Timothy 1:7). The Law of Attraction, also called new thought, is a belief system that teaches that humans have the power to affect supernatural events with concentrated thinking or meditation. It is not new in the sense that it has been around in many forms and under differing names since the beginning of human history. Those who participate in the practices associated are doing nothing more spiritually than worshiping devils whether they know it or not. The solution to being able to have supernatural power is through the power of the Holy Spirit, Who enables us to use God’s power for loving God and our neighbor. Renew your mind, read this article to learn how: How Do I Meditate on the Word of God? Very good information. I have done very little reading about the Law of Attraction, but see it referenced so many times in other books I have read. On the surface it always seemed wrong to me. Now that you have laid it out more fully, I know why it bothered me when I heard people mention it. Thanks for the reply David. I too have had times where I have heard of something and for some reason it just did not leave me with a comfortable feeling. Later, after I have had a chance to learn about it, I discover why and the reason always has something to do with it not being true to God’s Word. That is certainly evidence of Spiritual discernment (1 Corinthians 2). This is why when I encounter people who want to study the cults, I tell them that they would better off spending their time studying God’s Word because when you know the normal, the abnormal stands out. When we are grounded and rooted in the truth of God’s Word, false teaching is easy to spot and any false system can be fully understood for what it is in less than an hour, no matter how complex. What a great synopsis of such a pervasive topic. 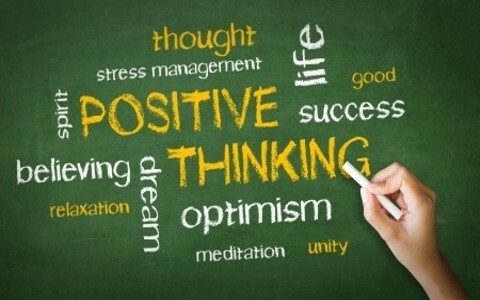 While setting our minds on the positive is one thing, expecting the same to result in supernatural power is another. Really, really great information. Thank you! Very good article. One question that may seem controversial, do you see this as part of the ‘name it and claim it’ type of prayer I’ve heard others talk of? If so, this seems to be a very perverted belief for a Christian to have. Thanks for the comment Tony. “Name it and claim it” as you mentioned, is very similarsimilar. This type of “prayer” has an assumption that God wants you to have what ever it is that you are praying for. Two Scriptures come to mind: Romans 8:26-27 and James 4:1-10. Romans tells us that the Spirit makes intercession for us “according to the will of God.” James tells us that we have unsettled lives and do not get what we want because we have not asked and/or we have asked for the wrong things. There is a presumption that if we name it and claim it that God will stop holding it back from us. This presumption is based on a belief that anything we want will become God’s will. We never consider for a moment that maybe God does not want us to have a big house, high paying jobs, nor financial wealth. May be he wants us right where we are so that we can minister right where we are at. Think about it. How many of us actually look at all that God has given us and ask how are we using it the carry out God’s mission? I would say very few based on my observation. This is something all of us should be seriously asking ourselves. Then maybe we will be less focused on not naming and claiming anything more than claiming salvation and naming the name above all names, the King of kings and Lord of lords, Jesus Christ for His unspeakable gift. Just found this post and it it most interesting. Having been a Christian most of my 64 years, I see clearly the answers you posted, for these are the ones I grew up knowing and believing. Some points you made, in only my opinion, seemed a bit off but minor to my own beliefs. I asked for guidence when by accident I came across the Abraham Hicks videos. I asked God to show me the truth, and so when I listened to that video, God who is faithful always called to mind a scripture for any point I was not understanding or seemed different from my Bible studies. 40 years of Bible study has not left me barron on this subject. All this to say when I attend my ear to God, you and Abraham Hicks are saying the same things. You of course may protest, and say I am under the influence of Satan, however, God has spoken to me for many years through His word and through meditation. When I am still, i know that God is, all knowing, omi present, omnipotent and unconditional love. Meaning no matter my condition or anyone else’s condition he loves me and all of us unconditionally. We are made in that image to also love unconditionally. And so on that note, may I ask if one spends their entire life trying to explain God to others, a task not for the faint of heart but one with great reward, how can any of us be the judge concerning how God works in anyone else’s heart? Hello Shelly. I have a problem with one thing you said: God all of us unconditionally.” The Bible says God is storing up His righteous wrath for those who reject Christ (Rom 2) and is angry at the sinner, every day (Psalm 7:11), and even Jesus said to the “religious” crowd of His day, you are of your father the devil, so there are only the children of God and the children of the Devil, so God cannot love those who reject Jesus Christ unconditionally. He will if they are brought to repentance and then believe in the Lord Jesus Christ. God is love, but above all things I believe, He is Holy, Holy, Holy. Please, be very careful about Abraham Hicks because according to Esther Hicks — the Law of Attraction is “translated from a group of non-physical entities called Abraham.” Hicks describes what she is doing as tapping into “infinite intelligence.” When Esther Hicks channels and becomes one with Abraham, the name Abraham-Hicks is used to define the alignment. Esther Hicks is a woman who has learned to channel these non-physical entities, called Abraham. She is able to open up a communication with Abraham and receives a block of thoughts from this infinite intelligence. Please be warned that this is not from God and is satanic. Dr. Williams and Abraham Hicks (Ester Hicks) teachings are far apart. Dr. Williams counsel is from Scripture, but Hicks is not. I say this in love. I am interested in your article because it is unsure from your text whether we agree or not. I am someone who has studied the Law of Attraction most intensely for the last year. My reason for doing so was that my life had hit a extremely turbulent time, following divorce, the death of my father, near bankruptcy and ruined friendships. I was not coping emotionally or physically, and desperately searching for something to make me love life again. I bought into the media-hype books of Law of attraction and was convinced that if I was suddenly rich, that my problems would be solved. It soon became apparent that I could not manifest a “castle as easy as a button” like Abrahim Hicks said. This in turn led to further frustration. I refused to turn to religion because having been a Christian and Muslim during my life, I found that neither served me any good. I was also not content to believe that suffering on this earth would give me a pathway to heaven. I wanted heaven now. Instead I seemed to strongly remember a time of my life of about 10 years before. During this time, I was not concerned with life, riches, material goods etc. This approach to life happened after I left a physical abusive relationship because a voice told me to. Yes, a inner voice! That time in my life was absolutely amazing! I want to point out that 2 times in my life, I have had an inner voice speak to me. And a 3rd occasion I remember so vividly, is feeling such intense love for the present moment, that everything faded out. The people surrounding me, the place were I was, etc etc. During those years, I had the most happiest times, yet lived like a normal human being. I wanted this mindset back. Why? Because I felt then that a higher power was looking out for me. It seemed then that every emotion, a person could possibly feel was thrown at me. Anger, resentment, grief, sorry, etc etc. But none of it was pure happiness. You reap what you sow. All of these experiences, did lead me to believe that yes, we do have power. The problem was the vast majority of “new age” books about the law of attraction have actually got it wrong. Florence is the most biblical out of all of them but because of their works, i do believe that the law of attraction is firmly stated in the Bible, Quran, and every other holy books. The problem is though, that over hundreds of years, the teachings of all these holy books have become just as distorted as the teachings of LOA. As always, man has manipulated the ancient texts to suit their own beliefs. Had my childhood minister explained the Bible to me in a different manner, would I have followed the path of a true Christian? Probably yes. As for supernatural, who are we to say what is supernatural? I remember as a child, a friend was laughing because the Internet had just become available to the masses and their grandmum would not believe that it was possible. When people wanted to invent electricity, the telephone and airplanes, people didn’t take them seriously. God wants us to create. He wants us to advance, spirituality, mentally and physically. So yes, I will admit that the majority of the LOA books are simply money-churning machines with no concept of how it actually works. But at the same time, I would say that the Bible and other ancient texts which are all closely related have because unpopular with the general public because over the years, they have lost their meaning. It has all become caught up in holy days, religious buildings, rights and wrongs etc. But yes, I do believe that the core concept of LOA is written in the Bible and other ancient texts. Man as normal has just distorted it. But we do have the power to create because that is what God wants us to do. Ironically, because of my study of LOA, I have actually done a complete turn and now started studying the Bible again! I found your reply very interesting and well put. I’ve also gone from the Christian church to disillusionment,then studied LOA. I am now both attending church and still reading LOA and although it’s hard to reconcile the two I also am beginning to see a common thread. Thank you for writing. i also didn’t really buy into Loa too much because i didn’t want to be thinning and “manifesting” on worldly possessions all the time because that becomes worship of those things. But I’ve learned a lot a lot from Napoleon hill because most of those things they say confirms the bible even though it’s not really practiced too much by Christians today. For example it’s written as the man thinketh so is he. Thank you Daniel. I do respect Napoleon Hill but I have issues that I found in my research of him as he called his personal success teachings “The Philosophy of Achievement”, and he considered freedom, democracy, capitalism, and harmony to be important contributing elements to this philosophy. Hill claimed that without these foundations to build upon, successful personal achievements were not possible. He contrasted his philosophy with others’ and asserted that the Achievement Philosophy was superior, and that it was responsible for the success Americans enjoyed up to that time. Hill blamed emotions such as fear, selfishness, etc. for the failure of unsuccessful people. The secret of achievement was tantalizingly promised to readers of Think and Grow Rich, but Hill said readers would benefit most if they discovered it for themselves. Although most readers feel that he never explicitly identified this secret, he offers these words about 20 pages into the book: If you truly desire money so keenly that your desire is an obsession, you will have no difficulty in convincing yourself that you will acquire it. The object is to want money, and to be so determined to have it that you convince yourself that you will have it. . . You may as well know, right here, that you can never have riches in great quantities unless you work yourself into a white heat of desire for money, and actually believe you will possess it. This worries me that money is the goal and not living a life of obedience. God never promises prosperity but actually warns that money can be a root of all sorts of evil. Do you see what I am saying Daniel? Please read my testimony. I used to follow the Law of Attraction and it created all sorts of trouble for me. Jesus is the way, the truth and the life. No one comes to the Father except through Him. In Jesus’ name I pray, Amen. This is the first time I have written a comment on anything to do with loa or religion. But I can tell you loa is real. I have studied both king james and law of attraction. And at the base of law 0f attraction is the teaching of GOd. To make this short In Romans it speaks uo, see it as though it has already happend. Which is what the law of attraction teaches. No the earth is not flat as once thought, it is only with those who are willing to go beyond that we can heal the world with love. I see the LOA as a tool only. We must be ‘connected to Source’ to receive answers to our prayers. This is not different to me than one must be ‘in the will of God to have answered prayer’. Jesus said, you have not because you ask not or ask amiss. Praying for material things that you may not really need is a pretty good indication you are not in God’s will. Positive thinking is scriptural. Jesus said, ‘whatsoever things are pure and of good report, think on these things’. Faith is believing in things unseen, according to Paul the Apostle. I do worry that non-Christians make a religion out this and almost worship Abraham Hicks instead of Jesus Christ. My ‘attraction’ to the LOA was that I became very negative concerning developments in America because I love my country and hate to see it go down the tubes. People pointed out to me that I was obsessed about this and very negative. I prayed about this and did some research and discovered LOA. Within a Christian framework, I think it is a good thing. A good tree bears good fruit, Jesus said. As I got into this thing, I was led to forgive people I had not forgiven, and to work harder on things in my life that were not ideal for a Christian and to ‘let go’ of the politics that so enraged me. The later is a work in progress, but I must say that it is like a sack of bricks taken off of my back. I still have to find some balance between political engagement and obsession. I believe the Lord used LOA to get my attention on things I had left unattended to. It is funny that the ‘thing’ I wanted from LOA was to be a better oil painter and to perhaps retire doing this work. I find I do not have a big struggle here (Abraham Hicks would say contrast) and the Lord showed me this was actually under control and on schedule and not to worry. So my BIG blessing was the correction about things I needed to attend to and it has really helped. All glory to God. Calling things that are not as though they were is not LOA. You are using your tongue like an arrow to direct your life, not attracting things to you like a magnet. It boils down to which spirit are you directed by, Christ or satan? Where your heart is your treasure will be also. Selah. you said, “God never promises prosperity”, but Jesus said at Mark 11:24, “Therefore I tell you, whatever you ask for in prayer, believe that you have received it, and it will be yours.” That is a promise in God’s word. There is nothing wrong with prosperity. 1Timothy 6:10, “For the LOVE of money is a root of all kinds of evil. Money is not evil, it’s the LOVE of money. We can be prosperous and have an abundance of money and still be a Faithful, God Loving Christian. God never promises prosperity but actually warns that money can be a root of all sorts of evil. Do you see what I am saying Daniel? Thank you Doug. Both verses or versions you quote say the very same thing (1 Tim 6:10) and I never said it was wrong to have money, so what I wrote is accurate. The translations you showed are saying the very same thing, so please tell me sir how I am wrong. Thank you for this information. I wanted to know if there were any books written on the Law of Attraction with a Christian retort so I can read more about it for some one who is influenced by it. I don’t really know where to begin to look for more information with a Christian perspective so help would be greatly appreciated. I was a christian, then I study LOA for 4 years but it feels like it have to be a balance in both teachings, I attract so many things with LOA but feel empty at the end, now I feel God ask me to come home, to his church but somethings feel off on the religion and somethings feel off in the LOA … I am reading the bible a lot, and trying to find peace in this path, anyone in this road? i feel like God want to give us everything, but we need to be conected to him because we can have everything but without him it doesnt feel good. Hello Jenny. Many are on the same road, not exactly, but close to the same thing, and God has given you everything in Jesus Christ and if you put your trust in Him, you will be connected with the Father, and the Son of God, Jesus Christ. Hello Anniemarie. I think the fear of God is misunderstood. It is not a fear of being struck down dead, but a holy, reverential, deep respect for God and His Word, the Bible. We are told that the fear of God is the beginning of wisdom, and this is true, so fearing God is good, but not in the way you described it. That’s not the true fear of God. Thank you for the brilliant article and for all the comments of serious people. I have explored the ‘New Age mumbo jumbo’ for 30 years with devestating results. This was God’s grace to lead me back to bible study and church. I just wonder why God doesn’t extend this grace to all humans that wander in darkness and seemingly have no corrective measures in their lives, having all the joy and pleasures that material life offers. A little smack of God could possibly save their soul…. Andreas, could you please tell me more about your experience with the loa. I almost fell for this new age philosophy but the holy Spirit led me to the truth. I strongly believe this is not what god wants us to do. It works but I have struggled with this. I know God has everything to do with this new mature happy confident person I am today but I used the law of like attracts like and I’ve been off psychiatric meds for 5 months because of positive thinking. I had been on them for 17 yrs. I have attained certain things like my job and home by applying scripture as well. I talk to God about what I’ve read in His Word and how it applies to my life and what would He want me to do. I practice positive affirmations daily. I can’t believe I’m off meds. With those I ams I have matured immensely. I just experienced heartbreak but I repeated those words of positivity and I’m alright and if I begin to grieve I repeat to myself that I am alright and within some time I become so. Belief is power. I never forget to pray and thank God for feeding me or giving me a shower or limbs that are strong. But how can you explain what I have experienced. Greed is evil. As I have prospered so have others because of it. I am a giver. The Bible also says God will give you more than you’ll need so that you can share the wealth and those people will give thanks to God who blessed you. For He loves a cheerful giver. Love of materialism is evil, but I desire a strong and powerful testimony that brings Him glory but it all changed for me when I decided to think and be happy. My relationship with Him strengthen because I spent less time hurting and more time conversating with Him. More time repeating happy thoughts, more time living in the moment. There are quite a few scripture that talks about belief and receiving. I don’t know. Thank you. I saw this title on Netflix and immediately smelled something fishy and became a Berean. People are always trying to empower themselves from within when the bible says that there is nothing good in us without the indwelling of the Holy Spirit. I will watch this “The Secret” anyway just to know whats happening in the New Age realm. The bible also preaches the same principals as the law of attraction. It says that whatever you ask for in prayer, believe that you have received it and it will be yours. Knock and the door will be opened, ask and you will receive. All of this is possible because of a higher power. They do not usually specify it in books like the secrete because people have different titles/beliefs regarding this higher power. Some call it God, some call it Allah, Krishna or the universe, either way, there is a higher power which is the source of our power which is why we have the power to create our lives. So to me practising the law of attraction is no different from praying. It just reminds me that I need to have faith and be grateful. God created us and everything there is in this universe, including science. We can never separate ourselves from him even if we wanted to. Even if his presence is not acknowledged, he is still there. You can choose to ignore him and be lost or you can believe in him and live through his power. “His divine power has given us everything we need for a godly life through our knowledge of him who called us by his own glory and goodness”. Basically all of this (the law attraction) is possible because of God. Hello friend. I would be careful with Marianne Williamson as she claims to be a “spiritualist,” whatever that means. I see little in her books that is biblical and the law of attraction is not biblical at all. In fact, the law of attraction is the name given to the maxim “like attracts like” which in New Thought philosophy is used to sum up the idea that by focusing on positive or negative thoughts a person brings positive or negative experiences into their life. This belief is based upon the idea that people and their thoughts are both made from “pure energy”, and the belief that like energy attracts like energy, so as you can see, it is not from God. I think it’s important to rememeber that at the end of the day, god is in control. He want to give us the desires of our hearts and have dreams. I worry for those with OCD, anxiety, etc being told to “think positively because your thoughts are manifesting” at the end of the day God’s plans for us is more complex than “pulling in life events with our thoughts”. It’s important to dream and have faith and pray, but don’t rely on visualization. Personally I feel like you made a bit of a jump with the worshipping devils thing. I believe the Law of Attraction works as any other force set in place by God such as gravity, light, electricity, etc as a system that humans can use to better their lives. The major problem is that people like to separate this force from God and claim it as their own ability or the ability of some other mystic cosmic force which is incorrect and offensive to the creator and sustainer of such a force. There is a lot of Biblical evidence toward the idea of ‘setting your intention for something to happen (2 Chronicles 15:7), having full faith that it will come about, not doubting it will happen (Micah 6:8, Matthew 17:20, James 1:6) and working towards the goal (Proverbs 16:3 , Proverbs 19:21). The universe, which we know is actually God, will provide these things for you if you trust in him and have faith in him (Psalm 33:1, Psalm 127:1, Mathew 7:7). The law of attraction is Biblical and works, so it is okay as long and you know and understand that it is the Lord who provides all good things. Certainly I can say that the ‘Law of attraction’ has worked for me and given me much good in my life but that good comes from God and God alone. Ultamitely I don’t worry because I know that God is infinite and will give me what will allow me to reach my best self. If anything ‘bad’ happens in my life, I can have faith that any other alternative would have led me down a lesser path, no matter how enticing it looked from my point of view. I would like to hear your thoughts on my point of view and any other questions or thoughts on the subject. Something can work for the Devil too but it doesn’t make it right. The Bible says these things are not biblical and not from God so their source is not from God, they must be from mankind, which makes them worthless. I agree with you my friend. Satan is the minister of sinister, and looks good from the outside, but inside is the evil, wickedness, full of all kinds of depravity. Yes, it does confuse the children of God. “The Secret” is a dangerous book for those who believe, but even more dangerous to the lost as it gives them a sense of how to gain contentment with self and the world, and no contentment is possible without Jesus CHrist.